Confessions of the Chromosomally Enhanced: How is Leanne Doing? Here's a real Confession of the Chromosomally Enhanced: The one component of my life that has caused me the most anxiety in adulthood is the anticipation of my mom's death and the impact that would have on Leanne. I stressed about the day something would happen to my mom and I would have to drive to another state and uproot Leanne from everything and everyone she's ever known and bring her here to our home to adjust to a whole new life. How would she handle it? Would it destroy her? Would she act out in protest? How would it impact our family? One of the blessings that emerged from our hellish summer was the fact that Leanne ended up moving in with us before something happened to my mom. My mom was incredibly ill and hospitalized for much of May, June, July, and August. Leanne moved into our guest room and she adapted beautifully. She genuinely loves being here for several reasons: 1. She loves her nieces 2. She loves to help 3. She loves to be on the go. There are plenty of opportunities for Leanne to nurture, assist, and stay busy with our little circus here. 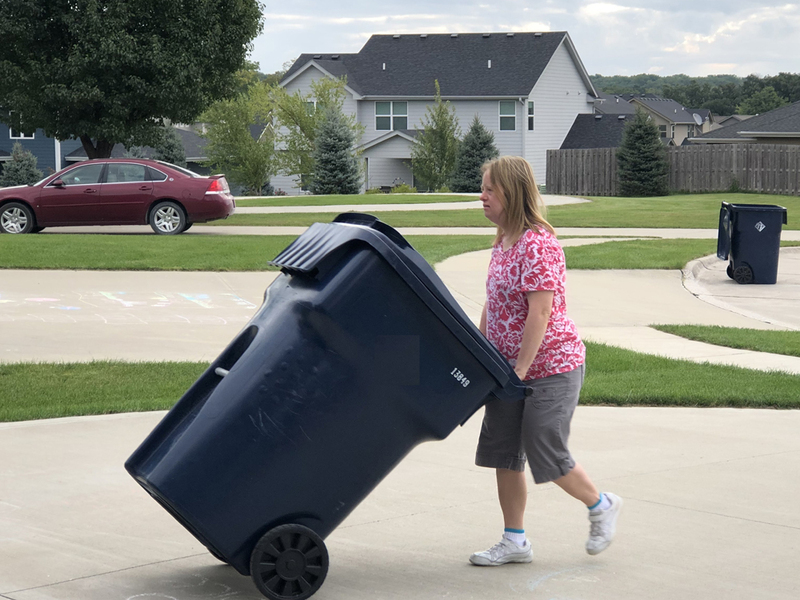 Every morning, Leanne gets up and at 'em (the process of adjusting her daily routine is worthy of a whole other blog post) and she helps get the girls dressed, fed, and out the door. 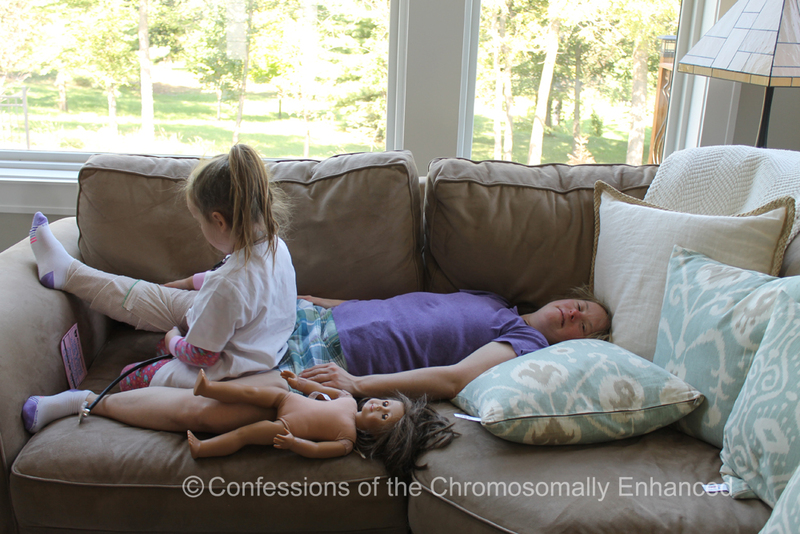 In the evening, she usually relaxes and watches TV in her room (she likes to have her down time) and then she joins us for dinner and frequently helps the girls with bath time and bedtime. Then, she goes back to her business (The Disney Channel) but she comes upstairs to say goodnight to Travis and I. We have the most fun conversations - just the three of us. Four days per week, Leanne goes to GiGi's Playhouse and participates in GiGi's U. She's working on employment skills, computer skills, money counting, literacy, nutrition, fitness and social skills while having plenty of opportunities to interact with other adults with special needs as well as those without. Over the summer, Leanne volunteered at Vacation Bible School on the music team. She continues to volunteer at the church every Wednesday evening; she loves her role taking care of babies in the church nursery. On the weekends, Leanne enjoys attending her nieces soccer games, neighborhood gatherings, and simply running errands. Since Mama Hop's passing, we've been focused on being as consistent with our routine as possible. Individuals with special needs thrive on consistency. If they know what's happening and what to expect, life is familiar and comfortable. We've had to work through a few kinks (seriously goofy things like Leanne using a mere drop of shampoo because "I don't want to run out!" So we got out a tiny medicine cup and showed her how much shampoo she needs to be using and we reassured her that we will happily replenish her supply of shampoo when she does run out) and I'm sure there will be more little hiccups down the road. 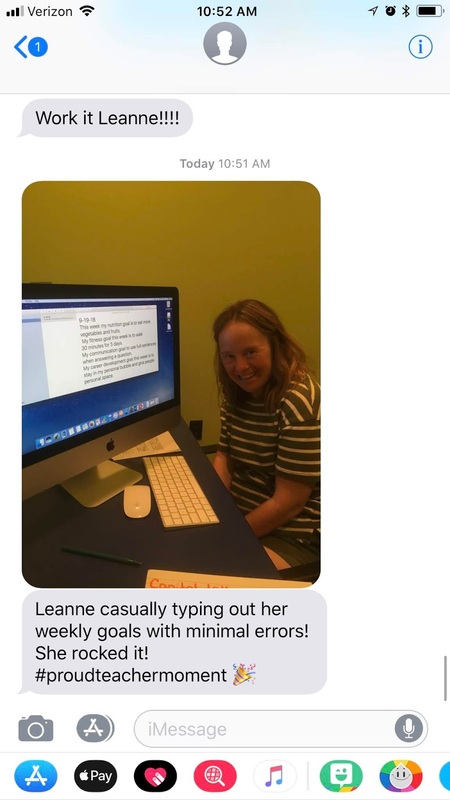 But overall, Leanne is doing incredibly well. She's so helpful that I wonder how I ever functioned without her. More importantly, she's so joyful and vibrant. As the big sister, she has truly set the tone for me on how to proceed through the grief process. She tells me that she misses mom but she loves it here with us. By living in the moment and focusing on today, she guides me forward and prevents me from getting swallowed by grief. For that, I am forever grateful. Even families who opt to share snippets of their lives publicly on blogs and social media are entitled to keep some things personal. In the past, I've blogged about the concern of oversharing (click HERE). Leanne has had her struggles and I genuinely believe they are more about her health and her adjustment to an entirely different role in our family than they are about grief. And some of her challenges feel too personal to delve into on the internet. Since I left for college, Leanne has been an only-child. Mama Hop was a nurturer and she loved taking care of people. She was lovingly indulgent in Leanne and she admitted it. So one can imagine how much things changed for Leanne when she became the sixth member of our household and was thrown into the mix with 3 small children. Leanne was accustomed to being waited on. I'll never forget the day I was driving and Leanne informed me that she didn't have breakfast. I said, "Why not?" She said, "Because no one gave me anything." So Leanne has had a crash course in speaking up and in being self-sufficient. I've had to tell her that just because Mom did this for you, doesn't mean you can't do it for yourself. It's time to learn. She now knows how to thaw and microwave her own breakfast sandwich. And on days when she takes too long to get ready, she may only have time to grab a boring granola bar on our way out the door. You should have seen the appalled look on her face when I suggested that she could retrieve her own clothes from the dryer and hang them up! Clean clothes magically appeared in Leanne's closet when she lived with Mom. But now, she takes great pride in helping with the laundry. But she has moments of opposition. All females can relate to hormonal mood swings that make us a little less agreeable during a certain time of the month. Leanne is no different. 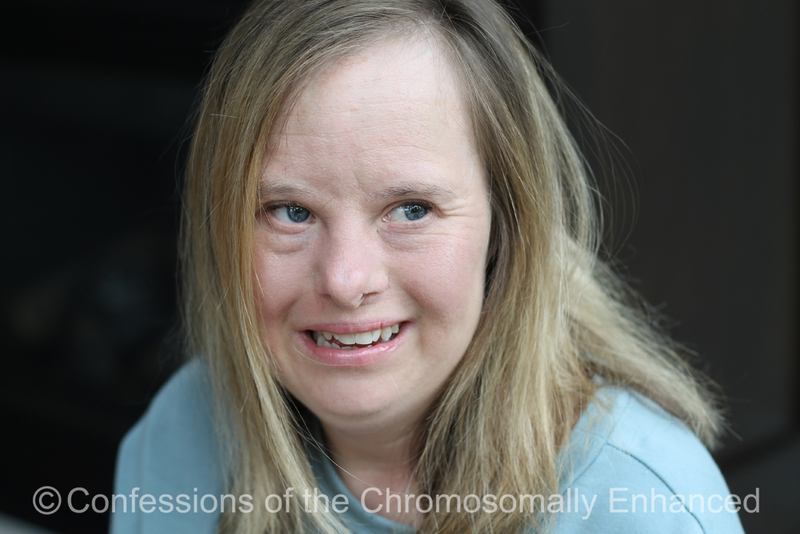 They say that individuals with Down syndrome are always happy...well, not always. 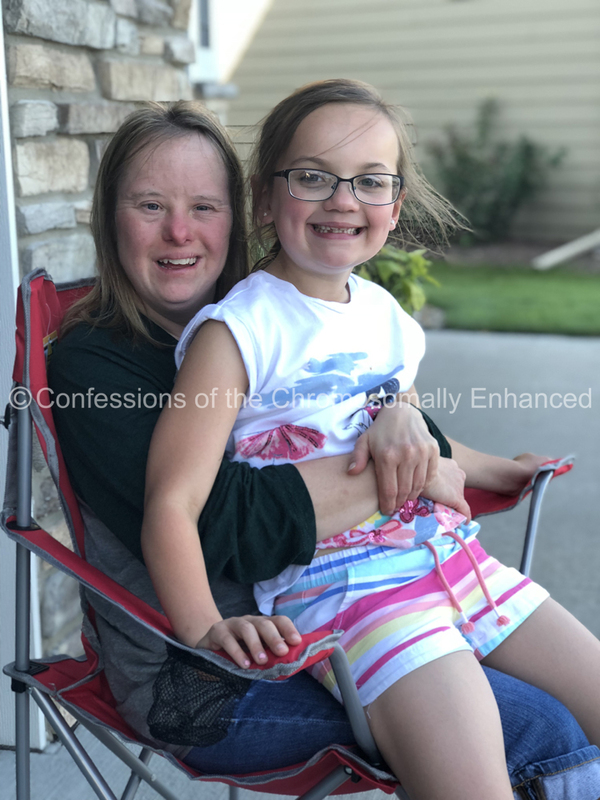 While Leanne has an overall outlook on life that is far more positive than most people I know, she is human and she experiences a wide range of emotions. The honest to Goodness truth is that most of the time, Leanne does remarkably well, all things considered. The one thing that we can promise is unconditional love and a willingness to work with her to help her find her way through this adjustment. The pride I have in her is unlike any emotion I've ever experienced. When followers leave comments complimenting Leanne or telling us how much you enjoy watching her do her thing, my heart just soars. That's my big sister! She is the coolest! I am glad to hear she is doing well and adjusting! I am sure Leanne is big help for you. You are a blessing to each other in so many ways! 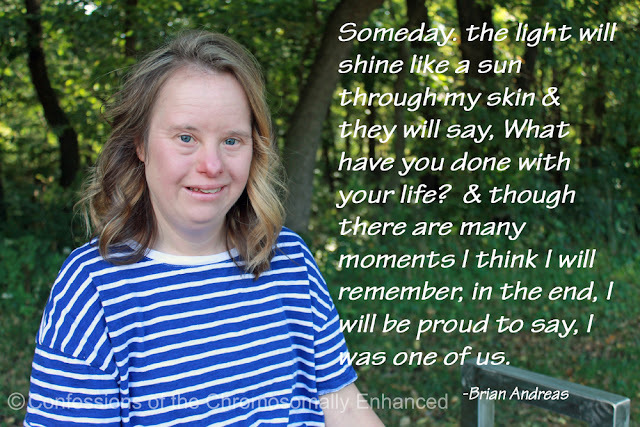 You are amazing Elizabeth! Aunt Leanne is so lucky to have you (and I know you feel lucky to have her). Thank you for sharing your family with all of us and just know that Mama Hop is always with you and I am sure is so incredibly proud of how both of her girls have handled all of the changes in each of your lives this past summer. Thank you for sharing your family with us I have learned so much from you. I pray for your family. I wanted to share with you that I work at a food pantry and we have a new volunteer, he has Down Syndrome. He is the kindest soul and he can't wait to get there to volunteer. He's also the first one to tell you what a good job you're doing. We could all learn a lot from him. I enjoyed reading every word, Elizabeth. Thank you for sharing your story, sharing Leanne with us, and for helping me better understand how I can one day prepare my own daughters (one with Down syndrome, one neurotypical) for a life someday without me. I’m learning so much and I appreciate these posts so much, as well as following along on Instagram. Sending so much love to you - now and always. She is the coolest and I’m so glad you share her and your family with us!! I've been so delighted to get the updates on how Leanne has been and how it's helped you too. You are such a great sister and she is too. It gives me much joy and excitement to see how my son with DS gets on with his siblings when they're all older. Oh I am so sorry to hear of your moms death. I’ve been a long time follower of your blog. I also lost my mom this year, today was her birthday. Thank you for sharing. This is Joyce, Sarah and I have not blogged in so long, over a year, so I've missed all that has happened in your life. I am so sorry to hear about your mom. My golly she was a shinning light to so many. I loved ready about her and Leanne and their adventures. Thank you for sharing your life with so many of us. You and your precious family are in our prayers.